October is turning out to be a big month. Just as I am writing this blog entry I am putting the final polish on my new website (yep this one). This is a pretty good chance I might even try to publish it for the first time tonight ! LESSONS - I am back teaching with several students signed up already for lessons. I did my first lesson last night (after a hiatus of a couple of years) and it was great to get back into it. I swear I learn as much as my students during a lesson. I’ve been developing a new curriculum that is a mix of theory, technique and a heavy emphasis on student playing. My number one aim is for every beginner student to walk away from their first lesson able to play a tune. A couple of good ones I been using are SAVE TONIGHT and WITH OR WITHOUT YOU. (4 chords - over and over). BAND - The band has been super busy performing every 2 weeks throughout Summer and now into Autumn. We’ve had a few personnel changes and a some folks have subbed in on drums - THANKYOU to some awesome players. This coming weekend the band is playing at The Spar in Tacoma. The setlist continues to grow 50+ tunes….and we want to keep pushing it. EQUIPMENT - I haven’t purchased a lot of new bass gear recently - Still loving my faithful Kubicki Factor bass - I think however a second one is on the horizon to keep it company. Amp-wise there is of course my trusty Trace Elliot rig and my Mark Bass rig that has served me so well for over 5 years now. I think when its time to replace it I will go straight out and buy another one exactly the same - these things are incredible lightweight powerhouses. F500 head into a pair of 2x10’s. 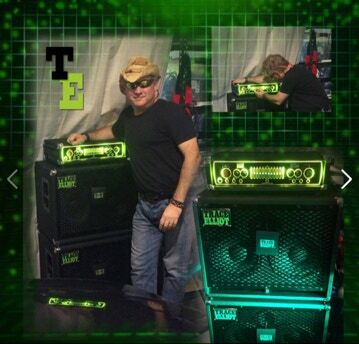 Total weight 35 lbs…..which is the weight of a single Trace Elliot 2x10 cab.